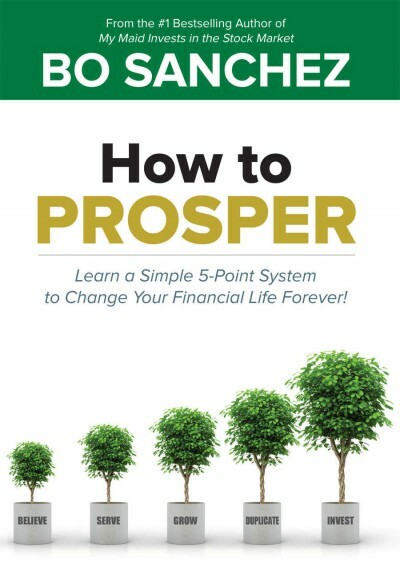 Bo Sanchez, the founder of Truly Rich Club wrote a book entitled, "How to PROSPER - Learn a Simple 5-Point System to Change Your Financial Life Forever". Don't have the copy yet? I suggest you treat yourself a copy of this short yet practical and life changing book. I have a copy of this book too. In fact I received this as a "SURPRISE GIFT" from the Truly Rich Club. That is one of the many benefits of being a member. You will receive unannounced gift. A bonus gift from Bo Sanchez' art.. Below is the main cover on the book. Look for it in your nearest bookstore. I bet you can read the entire book in one sitting, but my suggestion is not just read it in one sitting, you can go back and read one chapter at a time and them try to create an action items out of what you have read and then implement. Inside Bro Bo private mentoring group, there are collections of motivational and inspirational resources too called POWERTALKS. And one of those are these series - The PROSPER series. The first Powertalk on the prosper series is - BELIEVE. I created an excerpts from this video and shared it via YouTube. I hope you'll learn from this. Listen and internalize the message. If you want the complete/full length of this topic, you can try joining the mentoring club. Be part of the Truly Rich Mentoring Group, Now. Prosper you mind, prosper your money. If you want to prosper, you got to first of all prosper in your mind. If you prosper in your mind, you prosper in your money. That's the message. We need to change our BELIEF system. Our believe about money and wealth. In the video Bo Sanchez. mentioned that.... "You'll gravitate towards what you subconsciously want and avoid what you subconsciously do not want." We should avoid thinking on the things that we do not want and start BELIEVING and focusing on the things that we want to happen in our life. For me, that's very important. Positive thinking + Positive doing. = Positive Results..
OK. Enough about that. Just do me a little favor. please. You can share this video and blog link to you friends or relatives. thanks indeed. You can say...."Instead of watching non-sense video on YouTube, TRY this, and LEARN!" LEAVE YOUR decent COMMENT below and SHARE this blog to other people that you love. Thanks indeed. TRULYRICHCLUB101 <------- CLICK and Subscribe. PPS. Again for more of Bo Sanchez POWERTALKS, log in to the TRULY RICH CLUB, Now. @hapidbaydude, i don't have an ebook copy of "how to PROSPER" yet. but I can share you a copy of Bo Sanchez other ebook. Thanks for dropping by, ralph? I hope the ebook will help you. Done ionsturt. Thanks for dropin' by again. I STRONGLY AGREE ABOUT THE BRO BO SANCHEZ TEACHING IN THIS TOPIC "BELIEVE". GOD BLESS US ALL!